We are committed to serving families from all walks of life. You providing the information below allows grant opportunities that support our high-quality programming and your overall experience. -I understand that members may be photographed for the possibility of being used for publicity and I give exclusive rights to these photos to the Jones Center and waive all claims for compensation for usage. -There is a non-refundable $15 yearly admin fee for all monthly and yearly memberships. -All memberships are non-refundable. -You may cancel (non-refundable) membership anytime with a written notice by the 10th of each month. 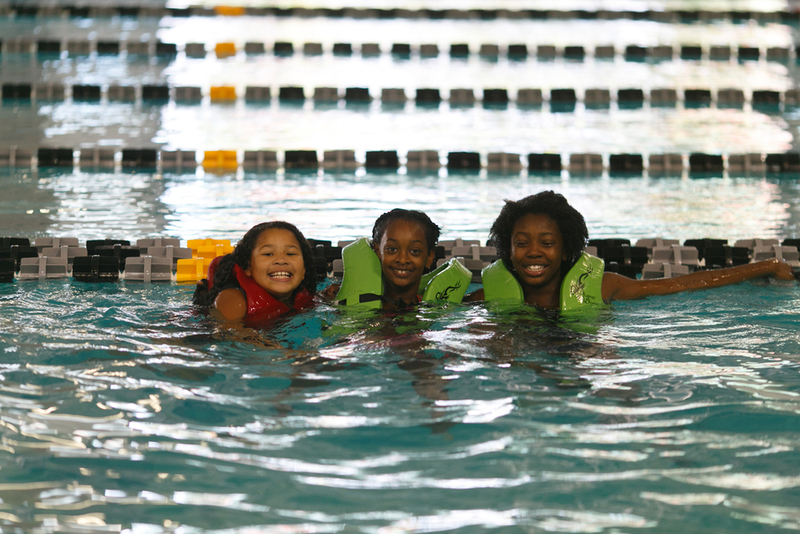 -A child must be 13 or older for fitness center use and 16 or older for use without parental supervision. I understand that the use of facilities and equipment at The Jones Center may involve risk of property damage or bodily injury including, but not limited to, broken limbs, paralysis, concussions, drowning, or even death and in consideration to my and family members use of the facility I, my heirs, representatives, executors, administrators, and assigns HEREBY DO RELEASE, INDEMNIFY, AND HOLD HARMLESS The Jones Center, its directors, employees, volunteers and participants from any course of action, claims, or demands including, but not limited to, negligence, personal injury, property damage, death, or an accident of any kind, arising out of or in any relation to the use of The Jones Center facilities. I acknowledge that my use of The Jones Center is completely voluntary, and I assuming all risk that comes with using the facility because I have read this agreement in its entirety. I hereby authorize The Jones Center to initiate debit entries and to initiate, if necessary, credit entries and adjustments for any debit entries in error to my (our) account indicated below and the financial institution named below, to credit and/or debit the same to such account. Any change or cancellation to this draft must be provided by the 10th of the month in written notice by either party. Should my membership draft not be honored by my bank for any reason, I realize that I am still responsible for that payment. *Your first payment must be paid with this card. ACH Bank Draft *Please fill out separate ACH form with account information. Membership Expiration Date: If undecided, your membership will automatically renew each month until written notice before the 10th of the month. Questions about our new membership pricing? See our FAQ page for more details. Cindy: The Jones Center is a one-stop shop for fitness for me and my family! We were thrilled to find The Jones Center ice rink, one of only two in Arkansas, so close to home! The skating coaches are so friendly and supportive no matter what level you skate at. Where else but The Jones Center could my husband work out in the gym, our daughter take her figure skating lessons and I attend a yoga class … all under one roof at the same time? Bill: Using the pool and fitness center are great ways to get exercise and keep my 76-year-old body in shape. I usually go to the fitness center 3 days a week and swim 6 days. My wife and I are retired so we appreciate the convenience, the good facilities and the family-friendly atmosphere. LaVeta: I usually swim about 40 minutes 5 mornings a week to keep my muscles and joints moving and to help strengthen my lungs and heart function. I appreciate the opportunity I have to use The Jones Center facility to enhance my health. In spite of the large number of people who come to the Center, they keep it clean and maintain the upkeep. The Center is a blessing to us! Stay connected! Sign up for our e-newsletter to become a Jones Center Insider.